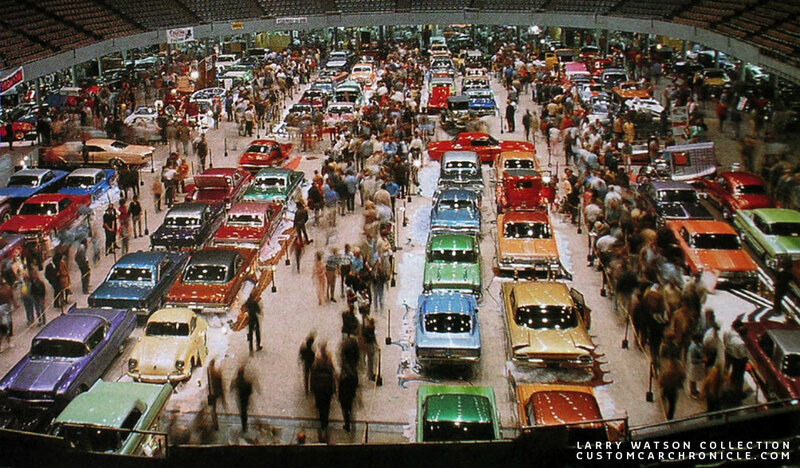 From the late 1950s to the 1970s the indoor Custom Car and Hot Rod shows were very big. 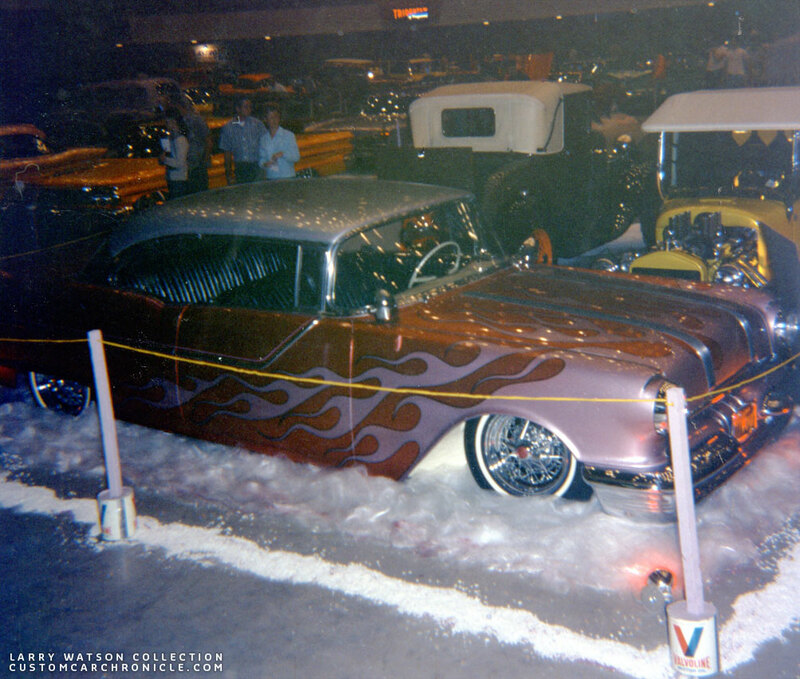 Larry Watson painted many cars during this period, and many competed at these car shows. A look at Watson Indoor Show Photos. 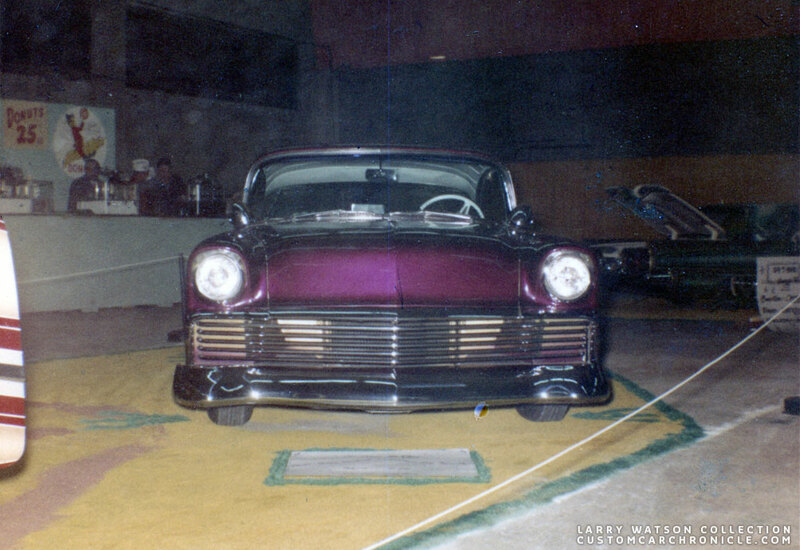 This article shows a selection of photos from indoor custom car shows. All of these photos come from the Larry Watson Personal Photo Collection. More on Larry’s personal collection can be found in the Larry Watson section on the CCC-Site. Or on the Custom Car Photo Archive. Special thanks to Roger O’Dell for scanning this amazing material and sharing them with us on the Custom Car Chronicle. Most of the photos in the Larry Watson Personal Collection are photos of the cars, bikes and boat painted by Larry taken outside, in front of one of Larry’s Paint shops, or on other interesting or convenient locations. 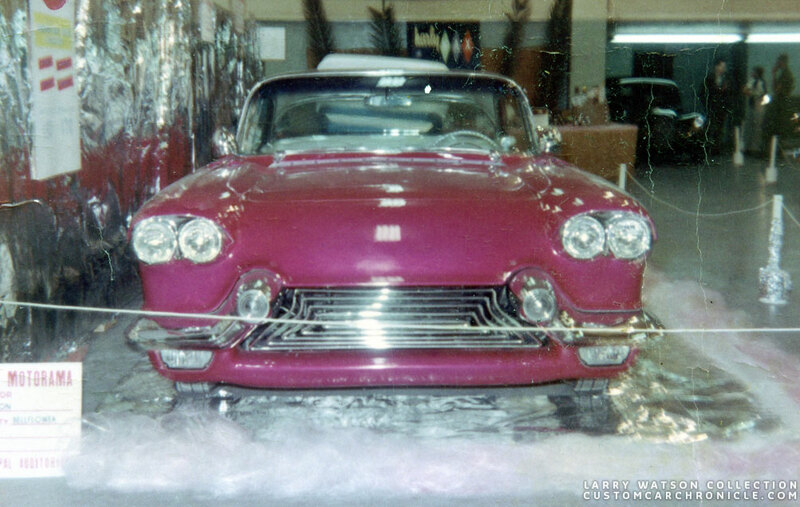 But there are also a small number of photos taken at several indoor car shows in the late 1950’s and 1960’s. 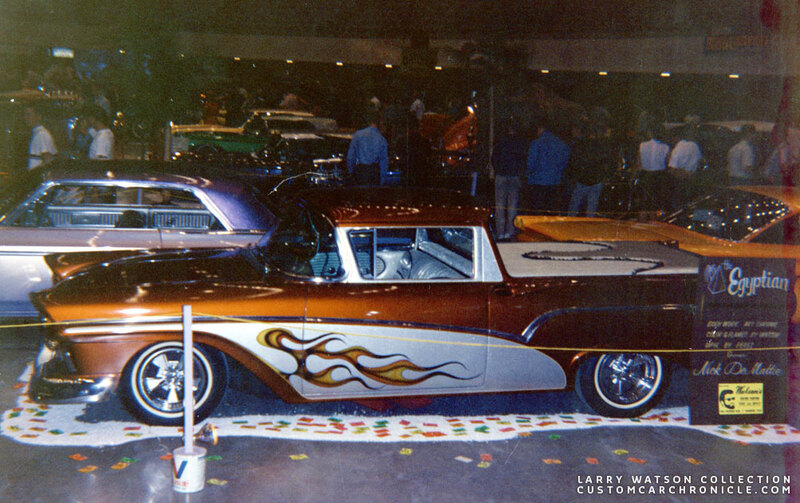 The highlight for Larry’s Custom Paint career must have been in 1965 and 1966 when a huge amount of Watson painted cars were displayed at two local Car shows. It must have been amazing to see over 40 Larry Watson painted cars in one location. For the public this must have been spectacular, but for Larry this really must have been the icing on the cake from his decade of hard work before these shows. Most of these indoor show photos and snapshots from Larry’s Collection are perhaps not as brilliant in color, contrast and quality as some of the outdoor photos, but they are very interesting none the less. It is very nice to see how these colorful cars were displayed at the shows, and how Larry displayed his business cards around the cars to promote his business. Always trying to get more clients to bring their cars and bikes to the shop. I wonder how much impact the Larry Watson big shows from 1965 and 66 had on his business. And if he gained a lot more new clients from it. There is only one photo of this wonderfully painted purple and lavender mildly restyled 1958 Chevy in the collection. Mercurygrille, smoothed body and replace front section of the side trim, plus and all white tuck & roll interior. 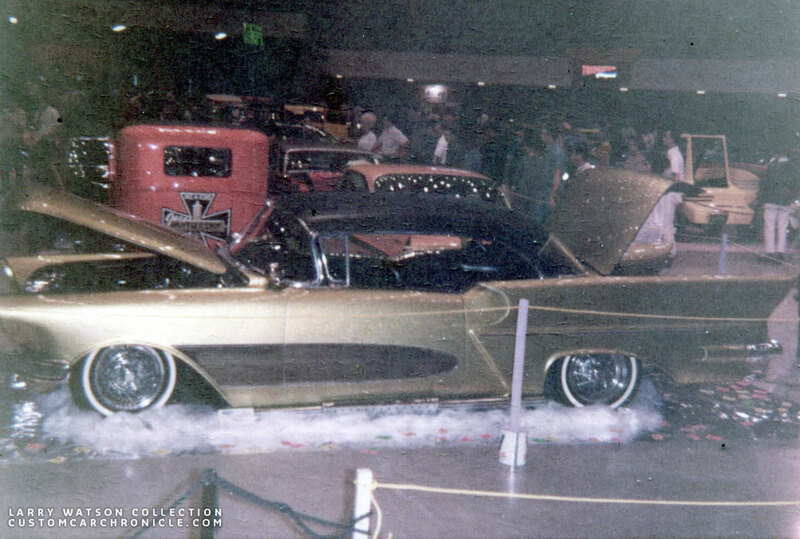 The snapshot was taken at the 1961 Renegades Rod & Custom Motorama in Long Beach California. Angel hair and aluminum foil must have been the theme. 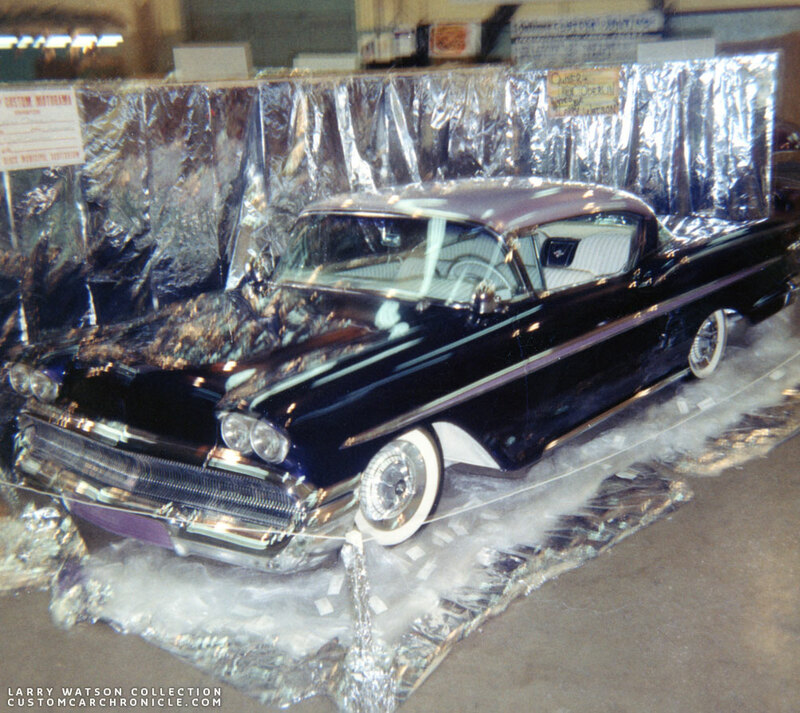 Larry’s own 1957 Cadillac Brougham was also displayed at the 1961 Renegades Rod & Custom Motorama in Long Beach California. Larry’s Caddy was also displayed with aluminum foil and angle hair. This photo comes actually from a section photographed at Larry’s Museum, hence the poor quality. 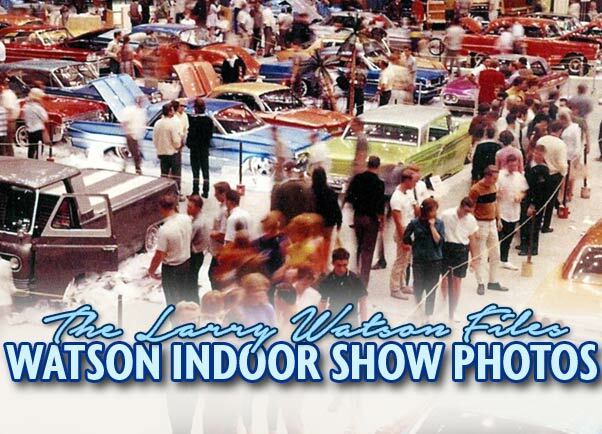 But since there are not to many overview photos known from the Larry Watson overview Cars shows from 1965 and 66, I wanted to include this one here anyway. 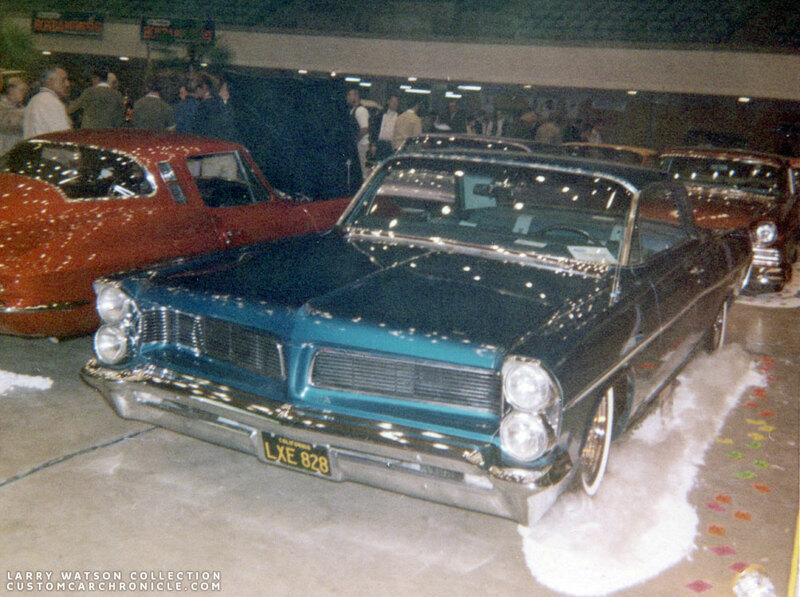 This one was taken at the 1965 Tridents Car Show in Long Beach. 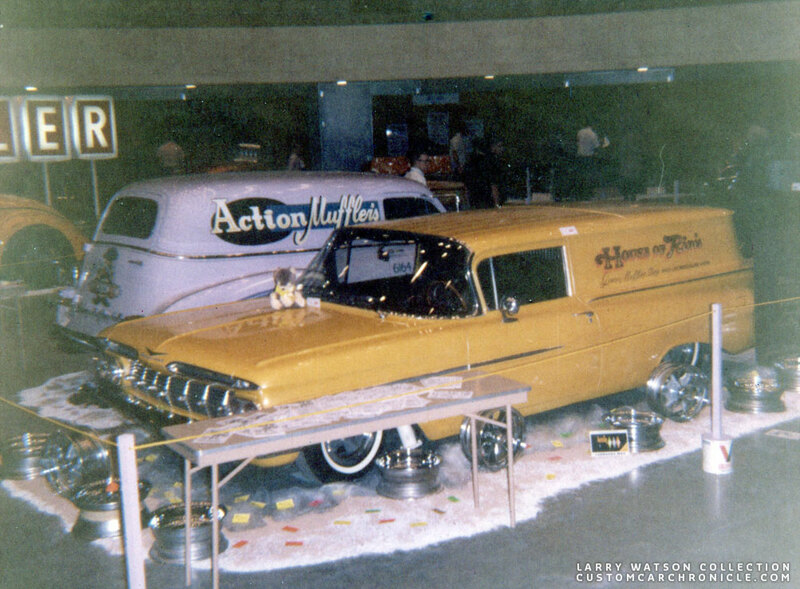 On the left we can see Larry’s 1961 Ford Econoline at the 1965 Tridents Car Show in Long Beach California. 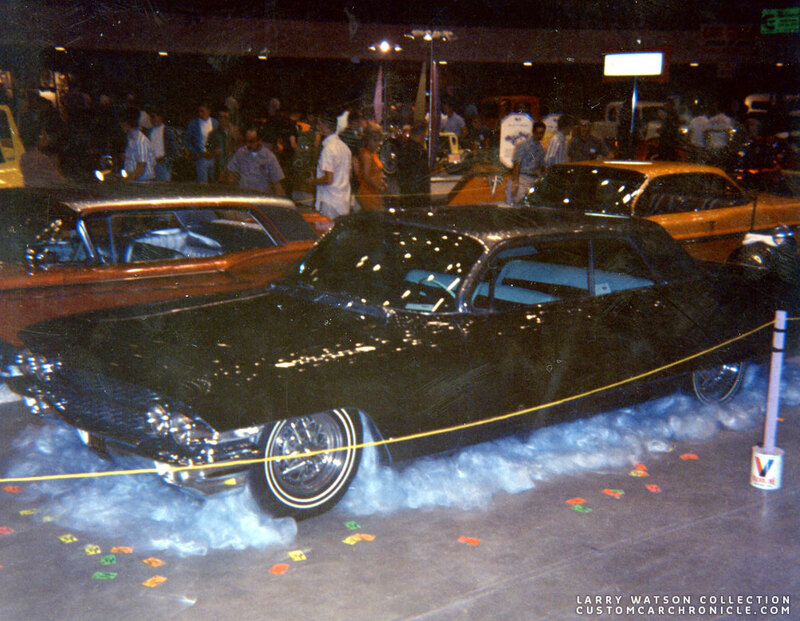 Larry Watson was the main attraction at this Car Show and had over 40 cars on display on the main floor. 40 cars that Larry had painted, and all were spectacular. This much have been such a great sight with all those wonderful colors and special paint effects all parked together. And it must have been like heaven for Larry, a milestone in his career. 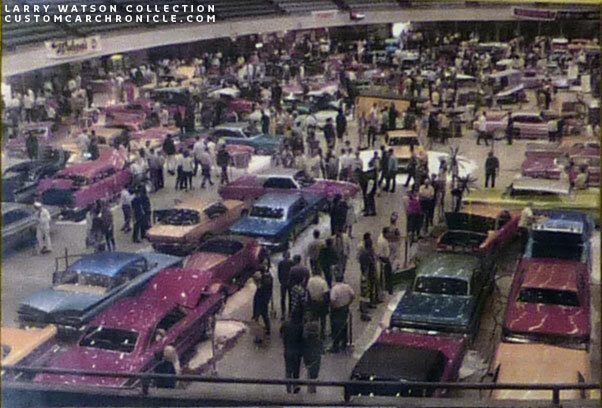 This overview photo wast taken at the 1966 L.A. Sports Arena Custom Car Show. Larry had no less than 54 cars he had painted displayed on the main floor and as if that was not enough, there were also 25 bikes he had painted in the higher floor. Larry Watson painted the House of Rim’s ’59 Chevy shop truck for Genes Muffler’s shop in pearl yellow and subtile flame striping. This shop was located next to Larry’s shop at the time. The car was displayed with a selection of the latest rims placed on white rock salt. Larry placed his colorful business cards from his Lakewood Blvd shop in Paramount around the car. Unidentified flame 1955 Pontiac Hard-Top in candy red and lavender flames outlined in black. 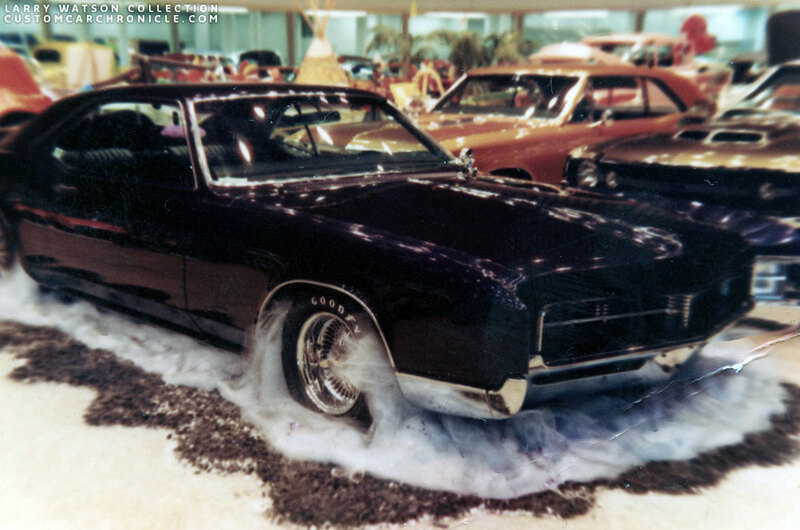 The car was displayed with angel hair and rock salt. Roy Abendroth’s 1955 Buick Busonic painted lime gold by Larry in a sea of angel hair and Colorful Watson business cards. Larry painted the restyled Buick for Bill DeCarr’s daughters Carol & Lana DeCarr. Another unidentified Pontiac with some more great cars in the background including Ed Roth his Surfite. Notice the creative us of white and colored rock salt, the colorful Watson business cards and the Watson Paint sign. 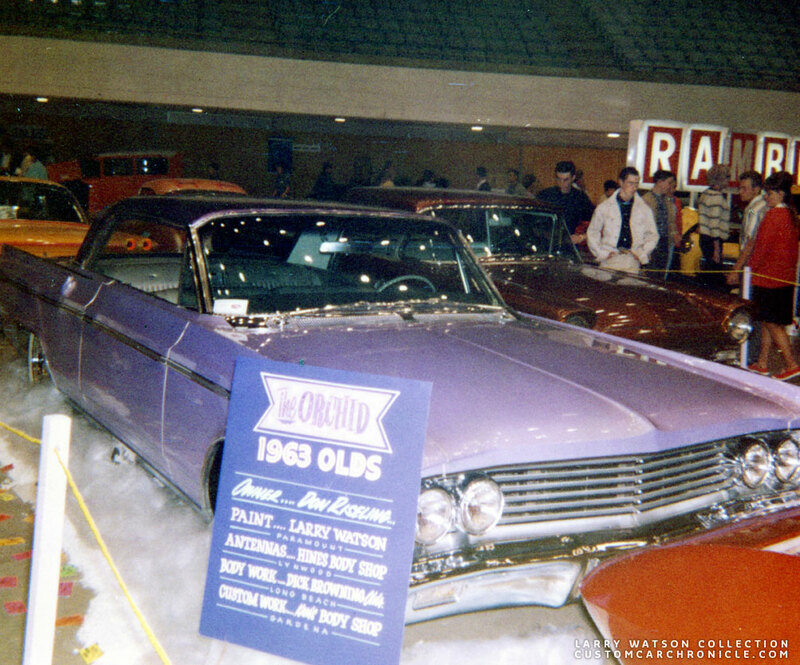 Don Riselings 1963 Oldsmobile painted in lavender pearl by Larry. Notice how the showcard makes special mention to Bill Hines for doing his signature double antenna’s on the rear quarter panel. 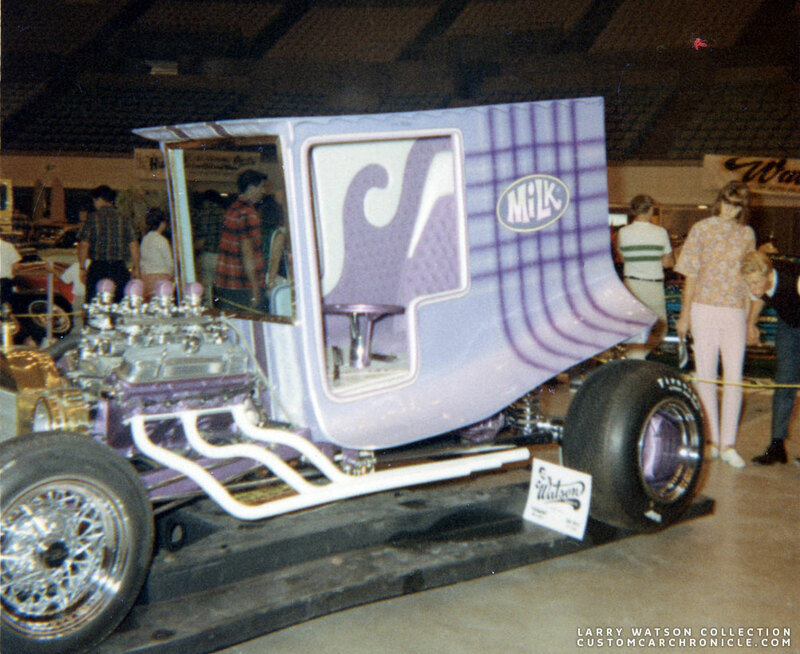 Dan Woods “Milk Truck” with the special Larry Watson Paint-job at the 1965 Tridents Car Show at the L.A. Sports Arena. The Milk Truck wins the Grand Sweepstakes and several other awards at this show. Larry created a 5-headedpaint gun especially for this car so that he could paint the graphics in the the car in two strokes. The cowl and roof has white veiling added. 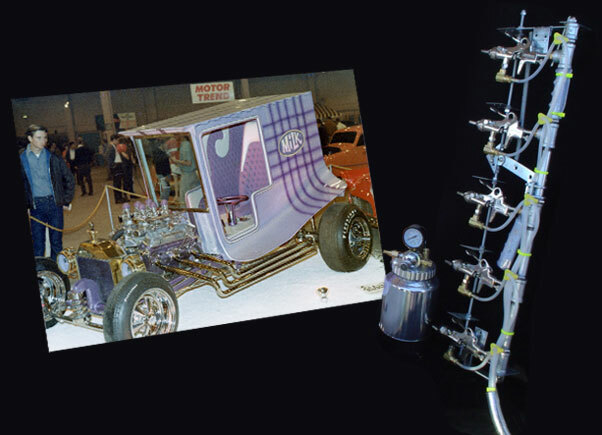 The 5-headed-paint-gun Larry developed for his special paint on the Milk Wagon, and later on a few other cars as well. Charles Kuhl’s 1957 Ford Ranchero. 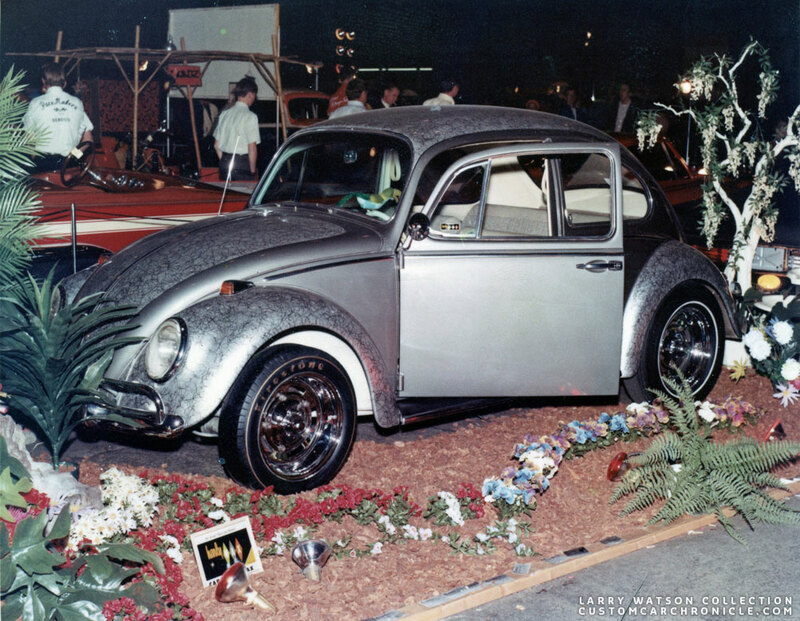 Larry painted this beetle in silver with cob-webbing on the fenders, hood and trunk as well as the roof over a slightly lighter silver base. This was a show done a little later than the others in this article. The very elaborate display was typical for the shows in the late 1960’s and 1970’s. 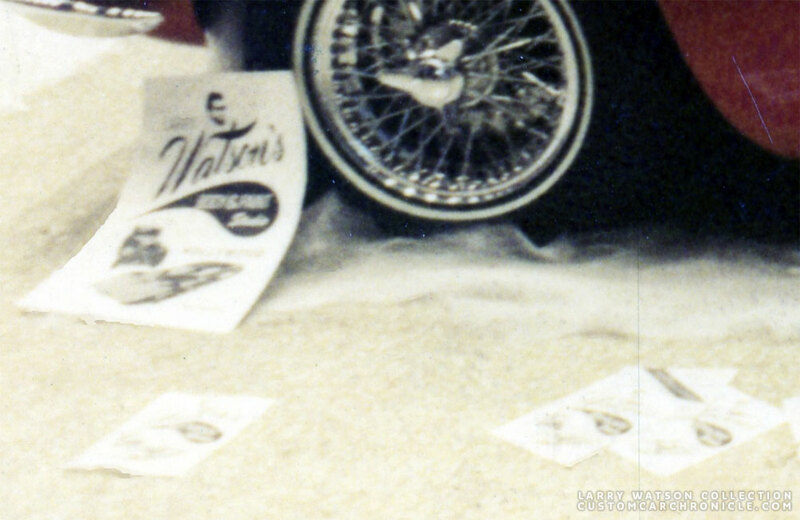 Enlarged section shows the neatly covered up colored light, the Harly Wax sign, most likely sponsored and the chrome Larry Watson Business Cards on the edge of the display. 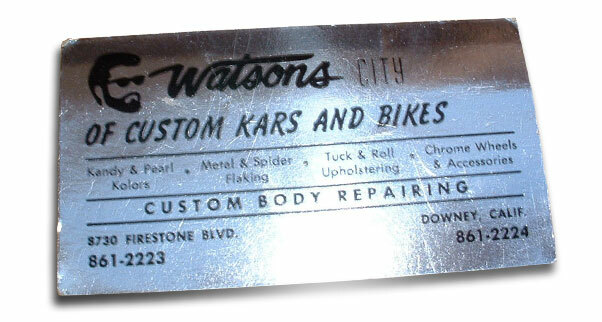 The Chrome paper Watson Business cards used at this show above are from Larry’s Firestone Blvd, Downey, California shop in 1968. 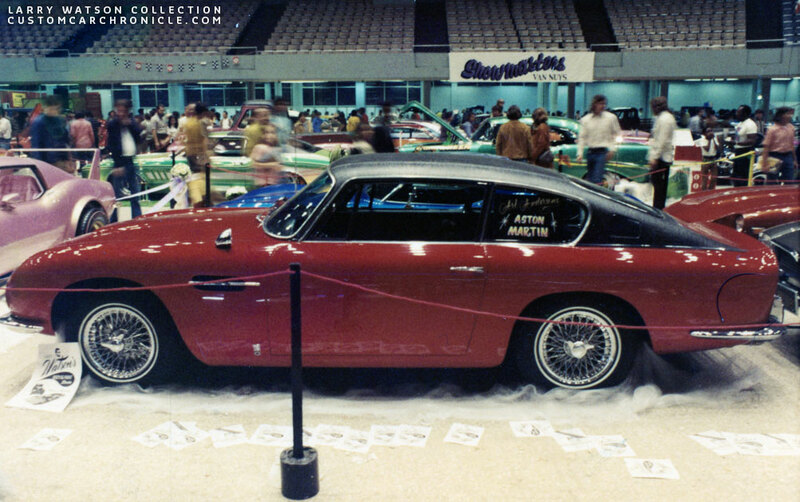 Art Anderson’s Aston Martin painted by Larry. This photo was taken in the mid 1970’s when Larry had his shop on Melrose in Holywood. What an amazing achievement that is to have so many cars in 1 place all painted by Larry Watson.! 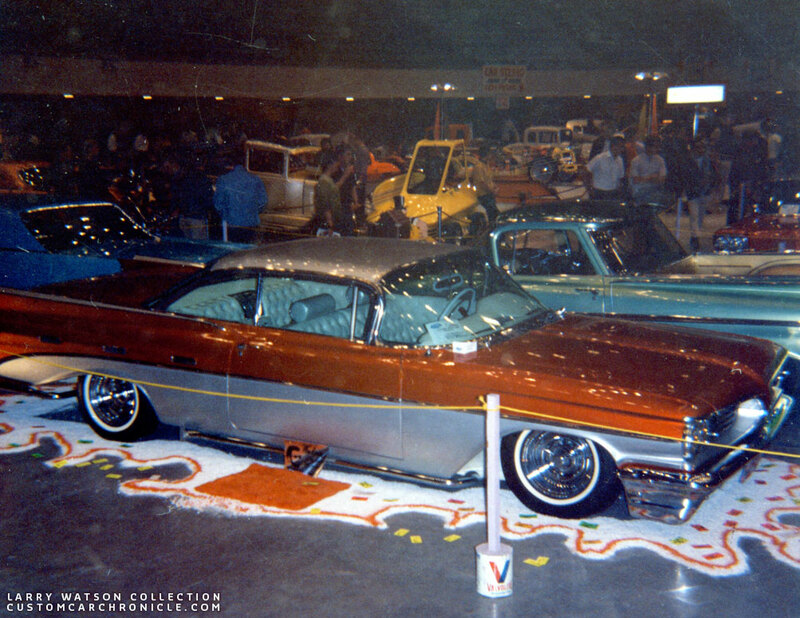 I have never been to a show of that caliber with so many cars all painted by the same person. What amazing car shows to have been able to go to and see. Thank you Rik for an awesome article on Larry Watson…..
Larry Watson is my God. Amazing, yes! Trying to surround what we see, as the HUGE influence of Larry Watson sinks it. Colors. No fender skirts. The times were achangin’, and this major transition in how customizing was approached can be credited in large part to this one creative man with vision. Out in the hinterland, we had no idea how many cars Larry had transformed, in ways we never imagined even. Yet, even through the small window of the little pages turned bigger pages, we were getting it. Lots to study here, Rik. Rik very cool flashback pictures, love the variety of custom colors! lots of angel hair around the wheels & what i noticed is most of the cars are slammed to the ground !! Thanks ! Love those overview shots! Man what it must have been like to see all those great colours all under one roof. Larry was a master!